Ocean County will likely see its first accumulating snowfall of the year overnight Thursday into Friday morning, forecasters said. The National Weather Service’s office in Mount Holly is predicting 1-3 inches will fall after the snow begins to fall after 1 a.m. The overnight low will be 27 degrees. The snow will continue into Friday morning, when less than another inch will accumulate. The snow is forecast to end by 10 a.m., and the high Friday will be 36 degrees. 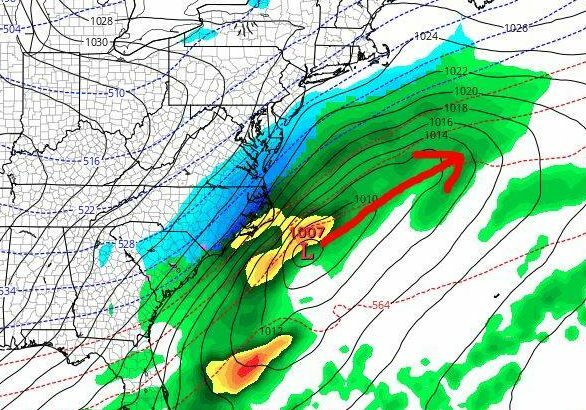 Forecasters are also cautiously optimistic that a coastal storm will largely miss New Jersey this weekend. What could have been a major snow event appears to be contained further southeast, down the Delmarva peninsula and out to sea. There is “still much uncertainty” in the storm’s track, however, and meteorologists are advising residents to be on alert. Dan Skeldon, a meteorologist with The Press of Atlantic City, said forecast models continue predict New Jersey will be spared the brunt of the storm. “That being said, we still may get clipped Saturday with some light snow, perhaps another dusting to an inch,” he said via Facebook.